BookLover’s Travel, LLC is the dream child of two Seattle area book-loving, travel-obsessed friends. We take small groups of women on tours that explore the art, culture, and history of destinations around the world, fueled by the books we love to read. Before you travel with us, we introduce you to the destination by reading fun and informative books, fiction and non-fiction, set in the locale you will be touring. While books form the common bond within our group, we are not limited to literary sites. You will visit a variety of places such as castles, villages, art museums, churches and all types of nature sites. Our travel adventures offer you in-depth exploration of each destination, visiting sites both famous and off the beaten track, with expert local guides. All tours are carefully researched, with special attention paid to those travel details that will make your trip memorable. Connie is a lover of language, received her Master’s Degree in English and taught English for 15 years. Most of her career has focused on writing, editing, and teaching. Connie started her traveling odyssey with a six-week tour of Europe in a small van with a local travel guru as he was just getting started. 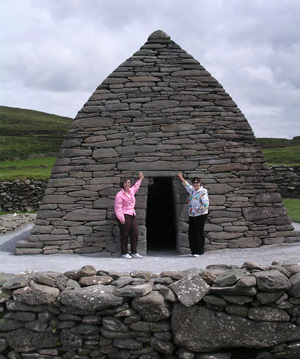 Bitten by the travel bug, Connie began creating her own literary-focused vacations, taking extensive literature and art classes in Ireland and Italy. BookLover’s Travel – Unique and memorable trips for bookloving travelers.